Hmm, what we’ve been up to. ..
Lots of schoolwork, driving lessons (yeah, that’s happening. I’d say a prayer or two for my driving instructor), work, picking up Daddy from the airport, he’s back! 🙂 Victor has a newspaper route now.. so he’s excited about that. We’re still on the lookout for a house. Mother is experimenting with growing sprouts. I’ve found something out. I have a fear of sprouts. I am serious! Sprouts scare me. I know. Ridiculous. Still true. Now, enough about me. What have you been up to? 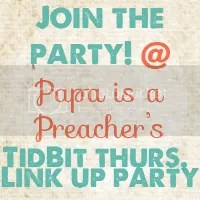 Time for TidBit Thursday again! As always, thank you so much for linking up, I so appreciate you all! Previous Article Reader Appreciation Award. Next Article Go Away Sandy! I missed this party, but I promise to be here this week! I've never understood the sprout obsession. I'm not very 'green' that way. Thank you Tara, he'll appreciate it I'm sure. You can have ours! Well they're not really mine .. but .. still. .. they're on the kitchen counter .. freaking me out .. I remember I used to like them too .. but now they freak me out. I have had a crazy week with work calls and last minutes changes to research documents, school and religious education meetings. I'm looking forward to Saturday! I fear I may have to give my apologies this week, or at least be one of those really annoying people to a Jacobs join (the ones that come but don't bring a dish and just eat everyone else's food). I have been put on enforced rest (not quite confined to my bed but I will be if I don't behave and yes it is ther other half over reacting). One of the things I am apparently not allowed to do is blog late into the night (which is the only peaceful time to read everyone's super words and comment without it ending up like gibberish). So I have less than 5 minutes left tonight, just enough time to say have a drink for me 😉 and I'll see you next week! I appear to be early to this party! My feet'll be killing by the end of the night with these precarious heeled shoes!